Note: Other includes landfill gas, biomass, and other gas. Reciprocating internal combustion engines, which are typically used for backup, standby, or emergency power, are now becoming increasingly popular for larger utility-scale power generation applications, especially in areas with high levels of electricity generation from intermittent sources such as wind and solar. The recent increase in natural gas or dual-fuel capable reciprocating internal combustion engine units has been driven in part by advancements in engine technology that increase operational flexibility and by changes in natural gas markets that have generally provided ample supply and relatively stable fuel prices. Reciprocating engines tend to be smaller than other types of natural gas-fired electricity generators and account for a relatively small share of power plants fueled by natural gas. As of November 2018, the capacity of the average reciprocating engine generator was 4 megawatts (MW), compared with 56 MW for natural gas combustion turbines and 166 MW for combined-cycle units. Based on data in EIA’s Preliminary Monthly Electric Generator Inventory, reciprocating engines accounted for 1% of the total natural gas-fired power fleet. 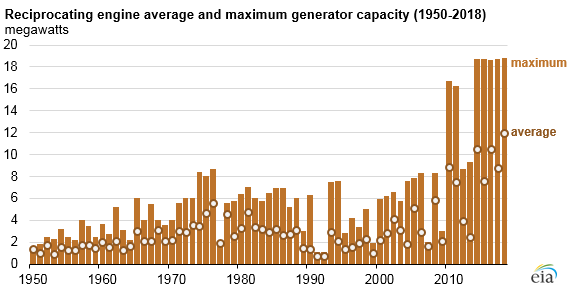 Before 2010, reciprocating engines typically had no more than 9 MW in capacity, but in recent years, larger units that range from 16 MW to 19 MW have been installed throughout the United States. Several of these engines are typically installed at one generation facility. The largest of these facilities is the Denton Energy Center, which came online in July 2018 outside Dallas, Texas, and it has twelve 18.8 MW natural gas-fired engines for a total plant capacity of 225 MW. One of the main advantages of reciprocating engines is their ability to provide incremental electricity quickly. Because these units can start and stop quickly and operate at partial loads, they have become increasingly important in areas with high shares of renewable electricity generation from wind and solar. Reciprocating engines can start up even when the grid has no power, which helps electric transmission grid operators match fluctuating power requirements and restore power after major storms. Engine manufacturers have also made advances in efficiency and emission reductions, particularly emissions of nitrogen oxides (NOx). In addition, power plants using internal combustion engines tend to require significantly less water than similarly sized combined-cycle or simple-cycle natural gas turbine plants. Power plants with large reciprocating engines are often located in states with significant renewable resources, specifically wind generation. Texas, which has the most wind electricity generation capacity in the country, has 910 MW of natural gas-driven reciprocating engines, or 20% of the national total (4,642 MW). Kansas (564 MW) and California (398 MW), both states with large amounts of renewable generation, have the next highest capacities of reciprocating engines. Red Gate Power Plant, located near McAllen, is a 220-MW plant that became operational in 2016. This plant features 12 natural gas-fired reciprocating engines, each providing 18.3 MW of capacity. Pearsall Power Plant, located near San Antonio, is a 202-MW plant equipped with 24 natural gas-fired reciprocating engines, each providing 8.4 MW of capacity. The plant came online in 2010 and can provide 25% of total generating capacity within two minutes and reach full output within eight minutes. Antelope Station is a 164-MW plant near Lubbock. The plant, which started commercial operation in 2011, consists of 18 reciprocating engine generators with 9.1 MW capacity each that can achieve full output in five minutes. Reciprocating engines were chosen to meet the challenges associated with grid stability arising from intermittent wind capacity and varying electricity demand for agricultural irrigation. The plant uses virtually no water, an important attribute in northern Texas.